*Disclosure: I am a COMET TV/CHARGE blogger. Opinions expressed here, however, are my own. There’s also Area 10! For the best in cult classic films, look no further than Comet TV! If you’re looking to Rage, there’s The Rage: Carrie 2 to fire up your night, or how about horror master Clive Barker’s Lord of Illusions? If you’re looking for some family fun break out the boom box and head down to Mcy’D’z because we have Mac & Me! FLASH GORDON FEAST (Thanksgiving Marathon) This Thanksgiving tune in to COMET for a classic Sci-fi feast! When your planet is in danger what do you do? Call former football player Flash Gordon to save the day of course! Flash heads into space with his merry band of friends to stop the evil Ming Merciless and one of his many diabolical plans to destroy our way of life. And you thought climate change was an issue? Area 10 For the best in cult classic films, look no further than Comet TV! If you’re looking to Rage, there’s The Rage: Carrie 2 to fire up your night, or how about horror master Clive Barker’s Lord of Illusions? If you’re looking for some family fun break out the boom box because we have Mac & Me! Babylon 5 (series) New on COMET! Creator J. Michael Straczynski's ambitious and complex futuristic space opera charts five years in the lives of those aboard the titular 5-mile-long space station, where personal drama plays out against a tense political backdrop of looming war between bitter enemies the Centauri and the Narn. Space: 1999 (series) Space: 1999 officially crash landed on COMET! The residents of Moonbase Alpha were just minding their own business when the nuclear waste stored there suddenly exploded, causing the moon to hurtle into space. After passing through a black hole and a couple random “Space Warps,” you begin to wonder, is there a mysterious force guiding them? CHiPs (Series) California Highway Patrol motorcycle officers Jon Baker and Frank "Ponch" Poncherello cruise the freeways of Los Angeles, solve crimes and help people in trouble in this cop show. The stakes usually weren't very high -- the better to highlight the personal lives of Ponch and Jon. Brawlin’ Bronson Marathon When there’s crime and you need someone to take care of business there’s only one man for the job… Charles Bronson! On CHARGE! In November is the Brawlin’ Bronson Marathon! Three classic Charles Bronson movies sure to get your adrenaline pumping! 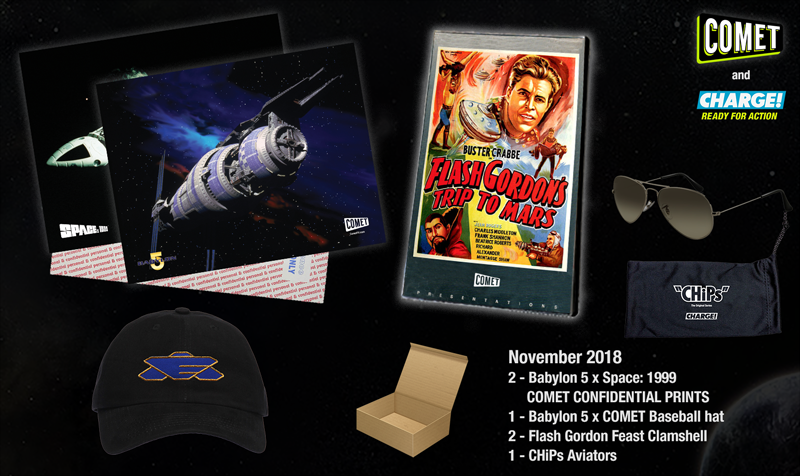 One of my lucky readers will win a COMET & CHARGE November prize pack! The giveaway will end on Tuesday, November 27th, at 11:59pm EST, and winner will be contacted via email and have 24 hours to respond, or an alternate winner will be chosen.